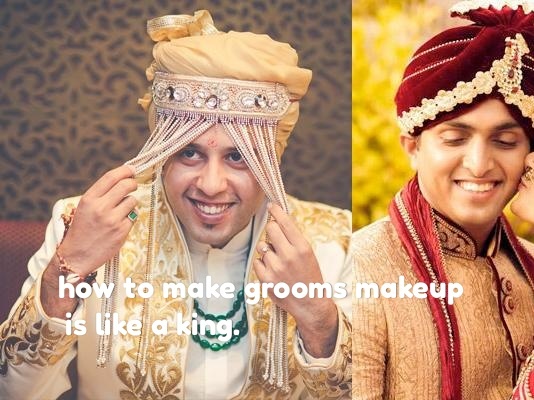 How to make grooms makeup is like a king By starglamours. make grooms makeup is like a king Being beautiful is not the only right of women, but if men wish they can look beautiful and stylish. Today's time has changed and now men are not ashamed to buy fairness cream at all. How to make grooms makeup is like a king. Today's modern men do everything from facials to waxing. So in such a way, you do not think he can make a make-up too. Yes, just watch your film stars, they also make use of make-up in their desire to show themselves beautiful. Today we will tell you some similar makeup tricks which you can use without hesitation. 1. Concealer - With Concealer you can hide facial scars and dark eye circles. So it is very important to have this makeup similar to yours, because the skin starts to look quite clean. 2. Foundation- It is also helpful in concealing stains like a consoler. Applying it causes the face to glow and the face starts to look photogenic. 3. Kajal- In the olden days, Raj-Maharaj did not come out of the house without wearing mascara in the eyes. Even today, some boys like to wear mascara in their eyes so that they can get four-moon in their smartness. make grooms makeup is like a king.